In The Da Vinci Code, Tom Hanks stared so long at classic art, he convinced himself that Amélie was Jesus’s great-great-great-granddaughter. In Angels & Demons, based on author Dan Brown’s prequel, here chronologically reconfigured into a sequel, Hanks’s famed symbologist Robert Langdon follows different-pointing Bernini statues around Vatican City in search of an evil group of intellectuals known as the Illuminati who plan to blow up the epicenter of Christianity with an antimatter bomb. Relative to its predecessor’s laughably goofy conspiracy theory plot, it’s an oh-so-slightly less absurd predicament. But if the story isn’t nearly as ridiculous as Da Vinci’s, director Ron Howard still impeccably maintains the series’s turgid mediocrity, from an early shot in which the harnessing of antimatter is depicted as a cheesy CG Big Bang, to the procession of wannabe-adrenalized, whip pan-overloaded scenes in which police cars zoom, zoom, ZOOM from one famous church to the next, to the supposed centerpiece suspense sequence featuring Langdon escaping a locked, oxygen-deprived Vatican archive room by—yawn—breaking some Plexiglas with a bookshelf. Howard’s follow-up to his 2006 blockbuster is, in effect, a geriatric summer adventure in which the appearance of action takes the place of the real thing. Langdon is called upon to locate the whereabouts of the centuries-old Illuminati, who were once persecuted for their belief in reason by the church and have now reappeared at the moment of the Pope’s death (and the election of a new pope) to kidnap and murder elite cardinals as well as obliterate Vatican City. 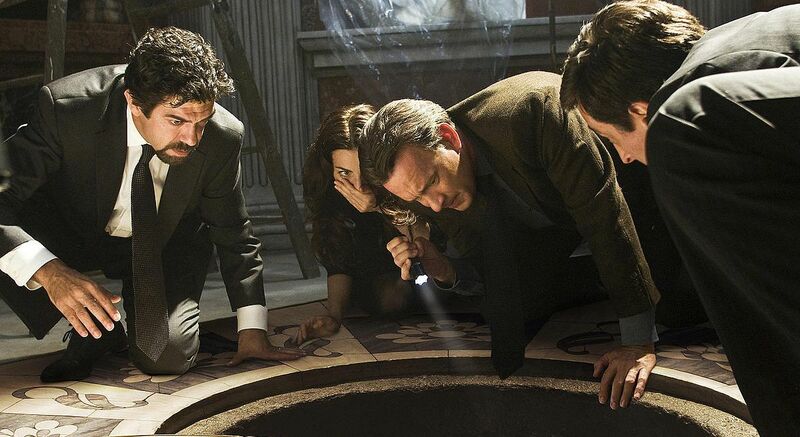 And, once again accompanied by a perfunctory intellectual brunette-beauty sidekick (Ayelet Zurer), he spends most of his impromptu Italian mission being confronted by outrageously intricate history-based puzzles. So swiftly are these elaborately constructed brainteasers introduced and then solved by a vomitous flurry of textbook blather that they soon wash over one’s indifferent mind. Despite being the crux of the entire mystery, the film’s riddles are dispensed and disposed of with a velocity that turns them into mere afterthoughts, superficial embellishments for a straightforward tale involving pseudo-breathless races against time, stacked revelations, and, apparently per the franchise’s requirements, villains with a taste for inflicting pain upon themselves. To prestige-ify its nursing-home-thriller maneuverings, which are so lazy that the finale hinges on a deus ex machina secret video recording, Angels & Demons engages in trivial back-and-forths about the battle between religion and science, most forcefully from the mouth of Ewan McGregor’s transparently suspicious priest, but also—in a blatant attempt to contemporize the proceedings—via the cursory sight of stem cell activists and opponents battling in the streets. On the question of Langdon’s own obvious agnosticism, however, it predictably has no guts, with the sub-Indiana Jones academic swashbuckler addressing the topic with a milquetoast-y “Faith is a gift I have yet to receive.” All the while, Hanks delivers a number of variations on his one basic expression—frantically perplexed, yet in command—as he stares at age-old books, floor sculptures, and other assorted antiques that are gussied up by the expectedly overdone cinematography and ominous choir-chanting-and-drums score. With two turgid adventures under his belt, Langdon can now lay claim to the title of cinema’s least captivating hero, though like this dreadful sequel, at least the symbologist’s hair is a bit shorter this time around.